United States president Donald Trump met his match on 26 June when Indian prime minister Narendra Modi made a trip to the White House. Both are global leaders. Both are one of the most followed political leaders in the world. This time though, PM Modi came prepared with his own diplomatic tool to outwit Donald Trump. Since coming into power in January, Trump has been involved in a series of awkward greetings and handshakes between the US president and other world leaders. Modi, in his three years in power, is an unabashed hugger. PM Modi, known to be an experienced hugger. bore it all in front of the whole world. Not once, not twice, but a whopping thrice. 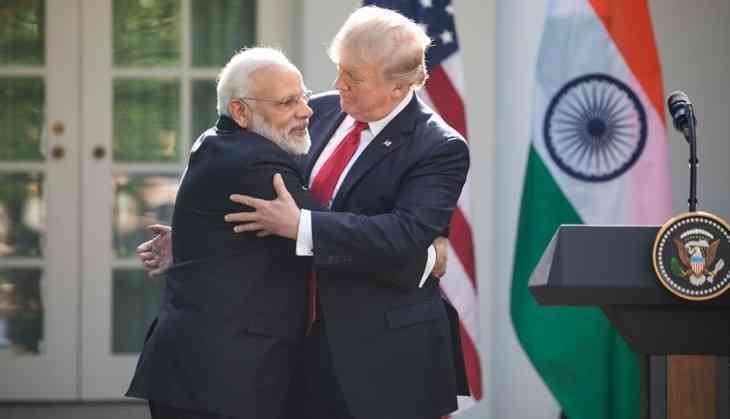 During their joint statements in the Rose Garden, Modi swooped in for his bear hug twice while Trump's handshake was left lingering. The second hug came after the closing remarks when Modi placed his hand on Trump's shoulder. Just before departing the White House, Modi engaged in a third and final public hug. While Modi and Trump discussed the issue of eradicating “radical Islamic terrorism", cleared the hurdles of the $2 billion drone deal, social media was alive, having a field day at the expense of expense of these two leaders engaging in a little bit of friendly diplomacy. Here's the best from Twitter that accompanied the various hashtags, #ModiTrumpMeet, #ModiInUS and others. "This is my wife, Melania. She hates me."